I toyed with the alternate title of: "Tips for Keeping Your Sanity When the Kids Go Back to School". Although it was attention getting and dramatic, it was a little too long. My kids went back to school this week, I know a lot of you out there are getting ready to do the same thing, and there are even a small few who have already gone back. (Seriously, where did the summer go?) I try really hard to be organized, but I know that I can always do better. I love seeing what other people do to keep their mornings on schedule, and how they control the mess that seems to come home with the kids after school. 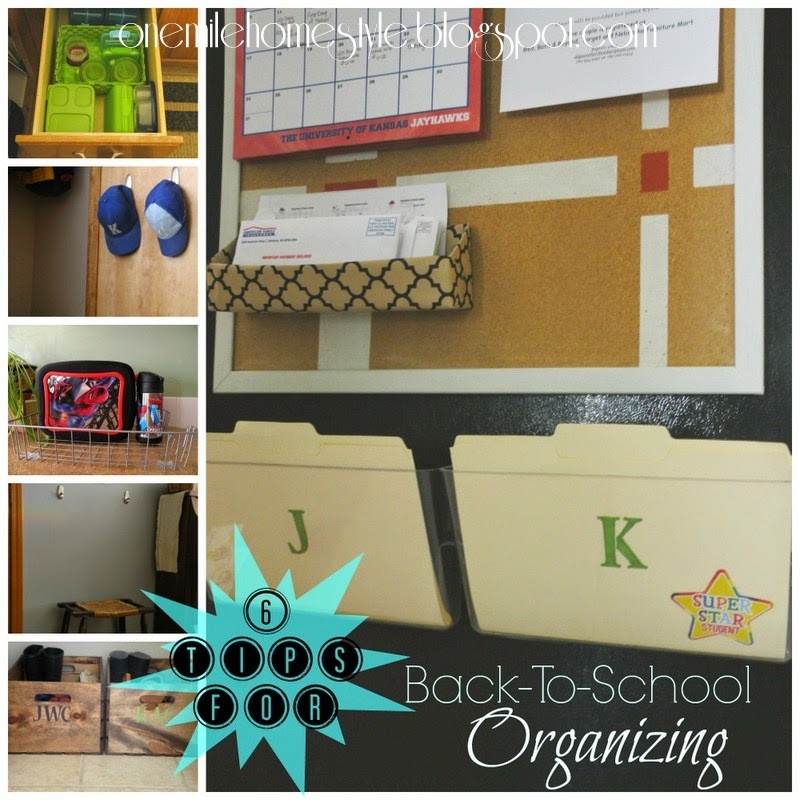 With that in mind, I thought I would share a few of the tried and true organizing tricks that we use in our home to stay organized during the school year. 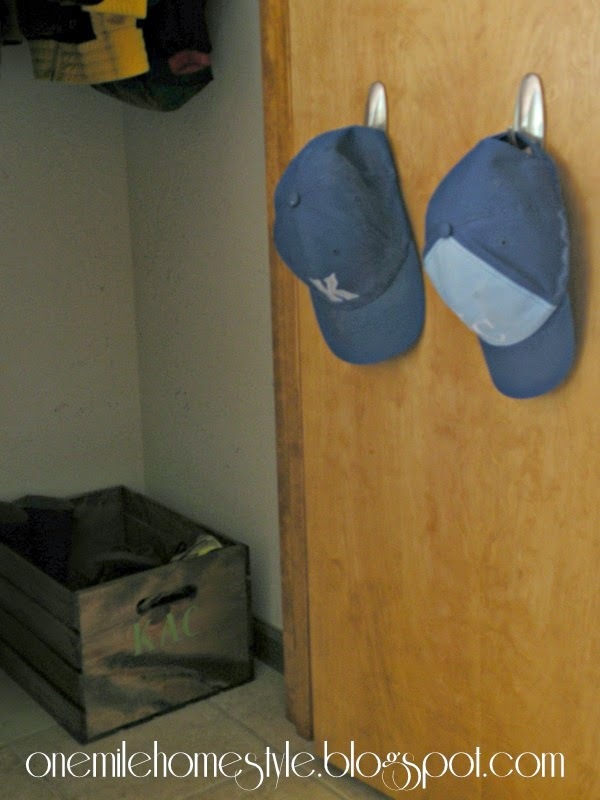 Hanging one command hook per kid right by the door to the garage gives the boys the perfect spot to leave off their bags in the afternoon, and pick them up in the morning on the way out. 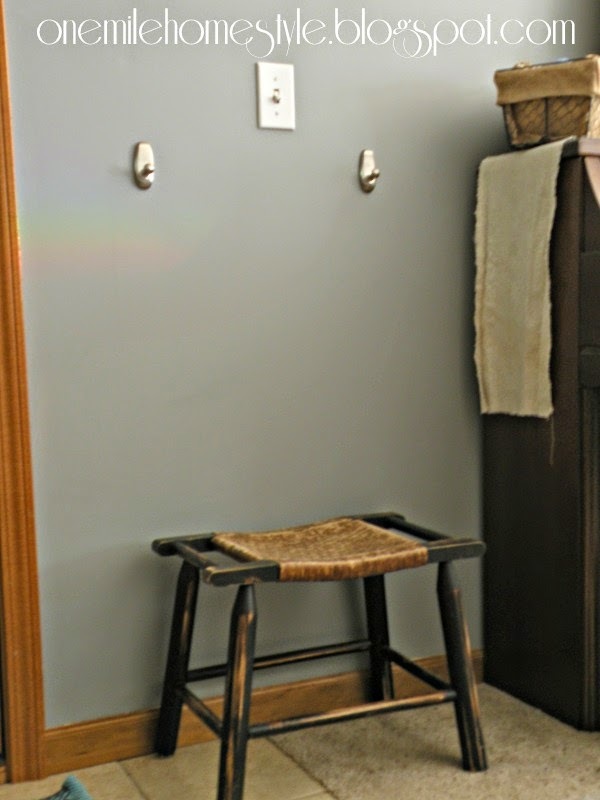 Adding the little stool gives them a place to sit when putting on their shoes, or set down books and papers as they are organizing their bags. Keeping all those school papers from taking over your home is a never-ending task when the kids are in school. On the side of our fridge we keep a command center that holds our calendar, invites and bills. Under the command center each boy has a file holder that they put all of their papers in when they get home. After I go through them, I put anything that needs to go back to school in that file and they know to check there for anything to go back to school. Again, with the command hooks on this one. Since the boys are not tall enough to hang their coats and jackets on hangers in the entry closet, we needed something more their level. So, on the inside of the closet door I hung a couple of command hooks right at their level. I, for one, like having the things I use in my kitchen on a daily basis readily available. My boys take their lunches to school everyday, so putting away their lunchboxes and water bottles everyday, only to dig them back out in the morning just seems like a waste of time. 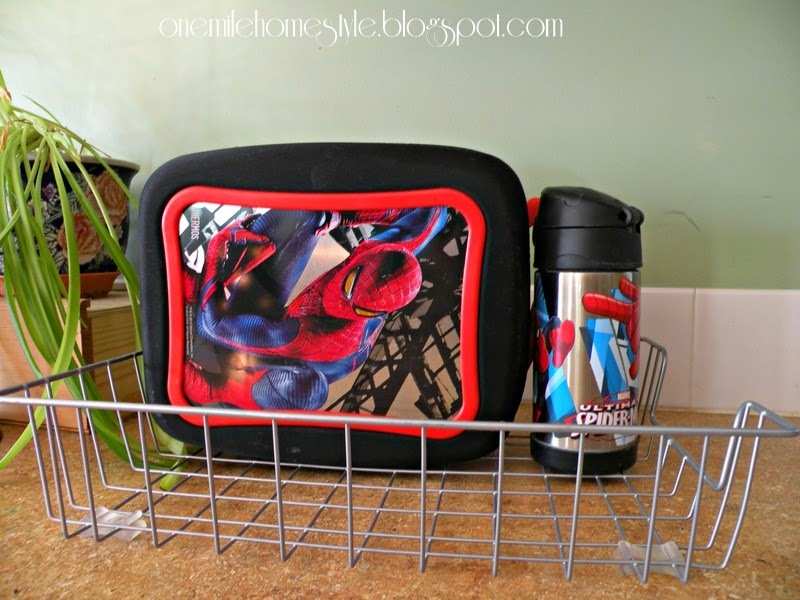 I keep a wire file basket on the countertop to hold the lunch boxes and water bottles. They are nicely corralled and the basket is not heavy looking in the space. As the kids are getting older, they are helping me more with packing their lunches. I had everything in a cabinet next to the fridge, but the kids couldn't reach. So, I cleaned out a drawer and all the little lunch containers fit nicely, well within reach. 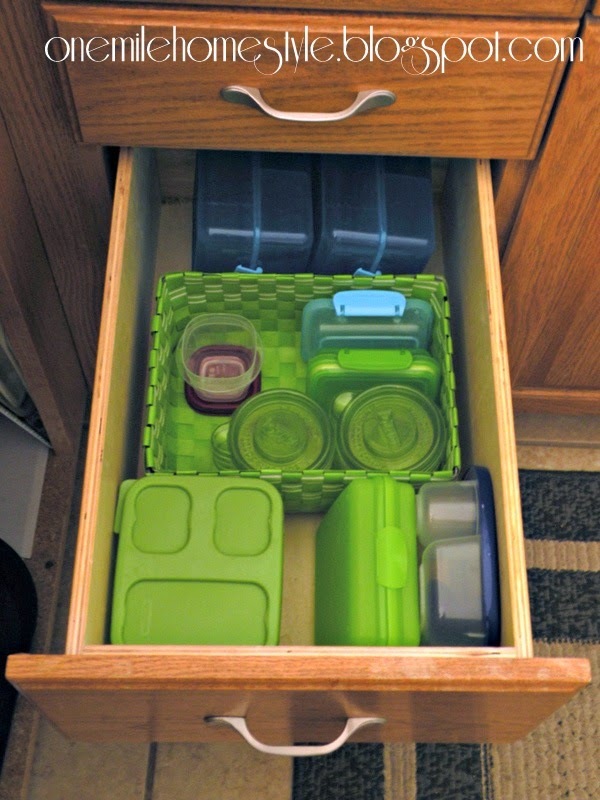 A basket from the dollar store keeps the smaller containers together with their lids, and keeps the drawer from getting messy. 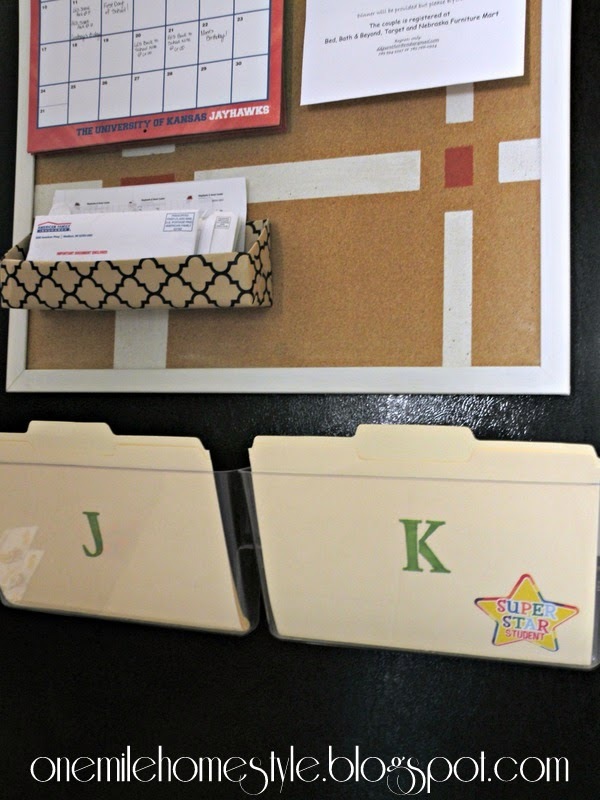 So, what tips do you have for keeping your kids organized and your school mornings running smoothly? 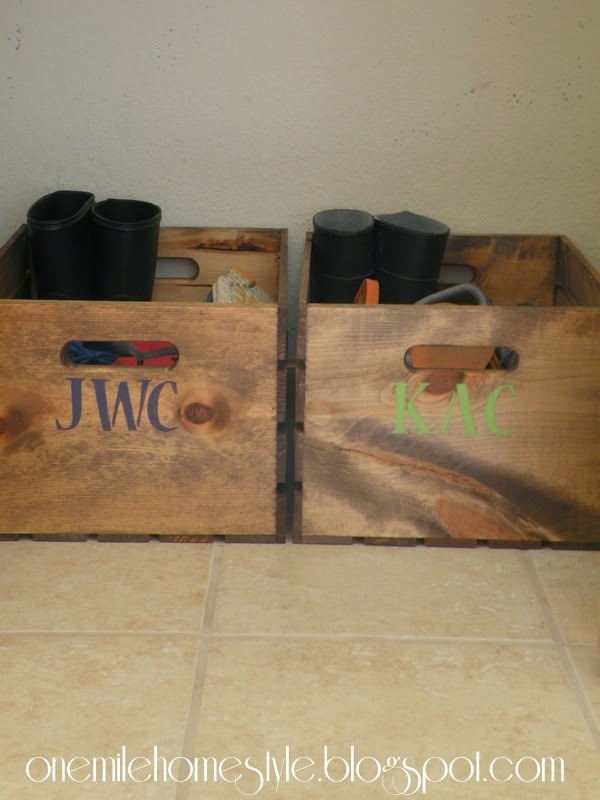 I love the shoe crates! Shoes are everywhere and I have tried several things! These crates seem to do the trick, toss and go!